Most students do not know what to take to college in their first year. A water filtration pitcher might not be something you deem essential, but think again. Many dorms are in old buildings with pipes that might still contain lead or are a bit rusty. Or the water has an unpleasant smell or taste. Imagine to be able to drink clean, healthy water any time you want without leaving your room. It is readily available and you would drink more and increase the daily intake of fluid. Staying hydrated is important for you health and your brain to work. Think of all the time and money you save. Bottled water is much more expensive than filtered water. Without the need to buy water bottles, shopping no longer means hauling heavy bags home. No need to interrupt your work to visit a vending machine just to get a drink. While this might sound like nice excuse to leave your desk, there will be times when you do not want any distraction. When you have an essay to write or a project to complete it is essential to focus on your task. If you do not have to worry about your drinks, you can concentrate better and easier. Less unhealthy soft drinks from cans that are bad for the environment. Think about the heaps of cans and empty plastic bottles you avoid using a water filter. Even if you do not consider yourself a a Greenpeace warrior and do not care about the environment, the amount of sugar you can avoid will have a positive effect on your health and weight. All food or beverages you prepare using filtered water will taste better and be healthier. Even the coffee or tea you prepare with filtered water will taste better. Rice or soups you cook with water from your pitcher filter will contain less unhealthy contaminants. 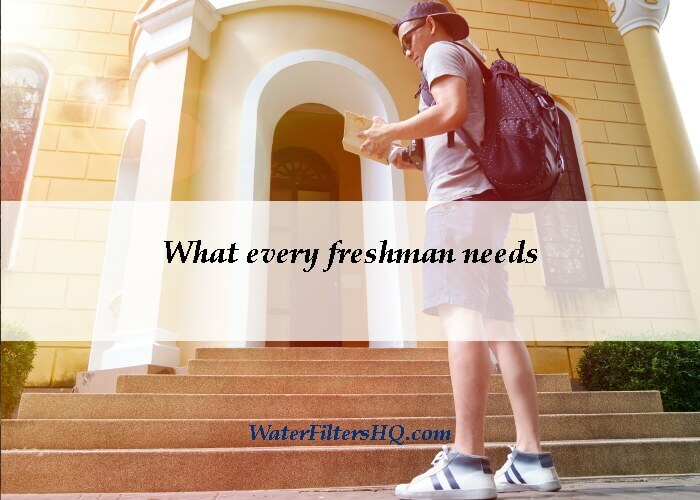 Get a filtration pitcher to take to college. They are available in different sizes and colors to fit your personal taste. Not sure which one to choose? The bestselling Brita, the stylish Soma or the "Made in Germany" technology of the Mavea? Follow the links to get some help with your decision.